LAU’s Clinical Simulation Center gathers anesthesiology residents from around the country for a one-of-a-kind training experience. Dr. Abi Raad organized two role-playing scenarios in rooms with high fidelity mannequins whose full-body health monitors can be controlled and manipulated from behind an invisible glass. The workshop also incorporated theoretical aspects of breaking bad news, with presentations by anesthesiologist Dr. Hanane Barakat and clinical psychologist Dr. Boutros Ghanen. 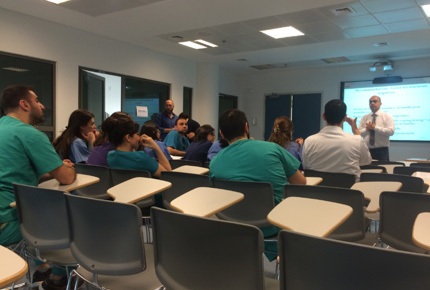 Last Saturday morning, anesthesiology residents from universities across Lebanon gathered at the LAU Byblos Clinical Simulation Center (CSC) for a workshop on “Breaking Bad News” to the family members of critical patients. 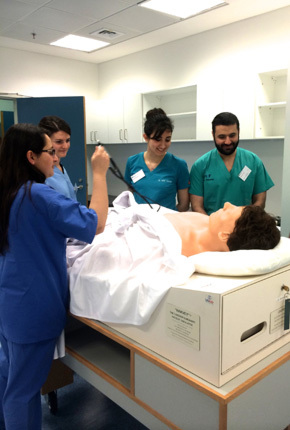 The center’s director, Associate Professor of Anesthesiology Vanda Abi Raad, organized two role-playing scenarios in rooms with high fidelity mannequins whose full-body health monitors can be controlled and manipulated from behind an invisible glass. Professional actors performed as the family members of patients with intra-operative complications, while the workshop participants were asked to play the part of the doctors tasked with breaking bad news to patients’ families. Strategically scheduled between these activities were lectures and debriefing sessions led by anesthesiologist Dr. Hanane Barakat and clinical psychologist Dr. Boutros Ghanen. Saroufin was impressed by the authenticity of actress Greta Aoun’s performance as the wife of a patient who had gone into anaphylactic shock as a reaction to anesthesia. Aoun’s distressed reactions required Saroufin to draw from her own experience and put Barakat’s suggestions into practice. Ghanem’s psychological insights were also welcomed by the workshop’s participants. Hend Youssef, a student from the Lebanese University, believes that the anesthesiologist needs to be both a doctor and a psychologist in order to maintain a good relationship with the patient and family. As such, Youssef was eager to hear Ghanem’s recommendations, which provided detailed counsel on how to break bad news with empathy and respect. “This is the first time a workshop on this matter takes place for anesthesiology residents nationally and internationally because the subject is delicate and very often underestimated in the curriculum of anesthesiology,” said Abi Raad.